What is “truthiness”? The American Dialect Society, which named “truthiness” as its 2005 Word of the Year, defined it as “the quality of preferring concepts or facts one wishes to be true, rather than concepts or facts known to be true.” Satirist Stephen Colbert popularized the word with a political spin, but it also applies quite comfortably to children whose “crazy lying” seems more firmly based in the wishful than the factual. Very young children are expected to tend toward truthiness; parents are less likely to expect them to understand the implications of their actions, or to think things through in sophisticated ways. But as kids get older, a lack of truth-telling is almost always interpreted as outright lying, whether or not there is malice and intent to deceive. and anything else that impairs executive function and the ability to interpret the world in an age-appropriate way may puzzle their parents by the quantity and poor quality of their lying—and by the fact that traditional disciplinary techniques don’t seem to change the behavior. For these children, it may be helpful to think less in terms of lying and more in terms of “truthiness.” They’re saying what they would like to be true, rather than what is clearly and objectively so. They don’t know what’s true. Children who behave impulsively may not have a clear awareness of what they’ve done. Children who have trouble with language processing may not have understood what was asked or expected. Children with sensory differences may know only what they feel. They know the truth will make you angry, and they want to please you. If a child has done something wrong—whether due to impulsivity, compulsive behavior, self-protective behavior, language processing problems, motor planning problems, or other causes related to disability—he may try to make it right by telling you what he thinks will make you happy. They don’t distinguish between fantasy and reality. What is objective to you may be subjective to your child. If one truth is as good as another, your child may select the one that seems, in his mind, to best suit the occasion. They can’t predict cause and effect. Your child throws a ball and breaks a window. His culpability in the act seems clear-cut to you. But a child who has trouble with cause-and-effect thinking may not be able to make the connection between throwing a ball and breaking a window. In his mind, if he didn’t intend to do it, he didn’t do it. They’re just trying to get in the conversation. 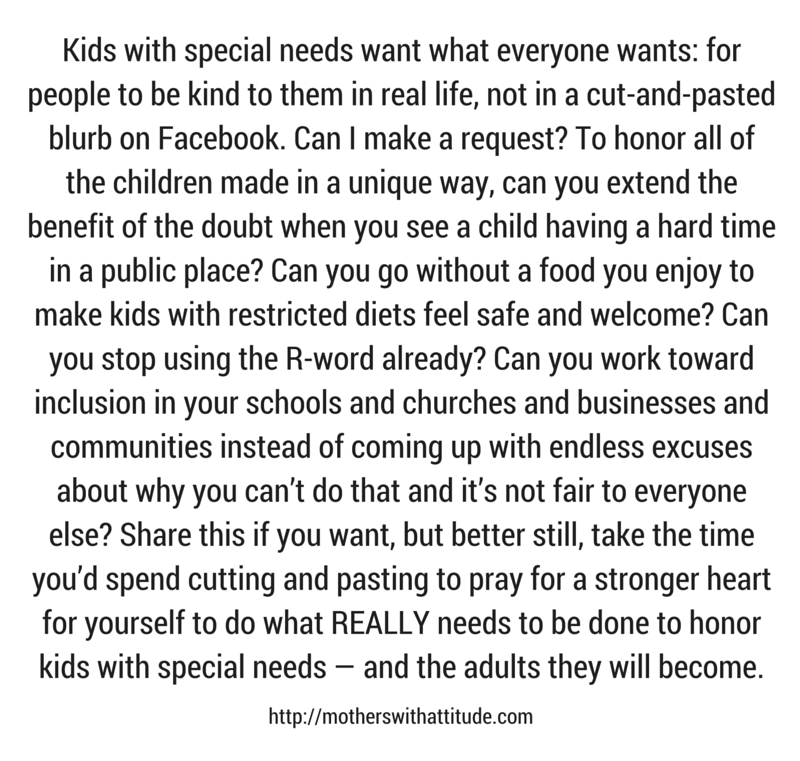 Kids with limited life experience or limited vocabulary may want to have something to say but no true contribution to make. Coming up with a story, however fanciful or false, may seem like the only way to participate. They’re stressed. If you know that your child can’t think calmly and clearly when stress levels are high, don’t be surprised if you see lots of crazy, stubborn lying in that situation. They’re telling their truth. Children with special needs often experience the world very, very differently than their parents, but that does not make their experience false. If your child stubbornly, desperately clings to a declaration that you feel is untrue—water’s too hot, work is too hard, an object can’t be found—ask yourself if it might be only untrue to you. Leave your child unsupervised as little as possible, so you always know the score. Make sure you have your child’s attention when you ask a question. If the truthiness in question requires a response, give a brief, judgment-free time-out. Tell your child what you think happened instead of demanding an explanation. Take “I don’t know” as an answer. Respect your child's reality, and be open to compromise. Make sure you tell more truth than truthiness yourself.